Situated on Bennelong Point in Sydney Harbor and close to the Sydney Harbor Bridge is Australia‘s premiere performing arts facility called the Sydney Opera House. In 1957, Jorn Utzon, was announced as the winner of a competition that was geared towards coming up with the best design of the opera house. 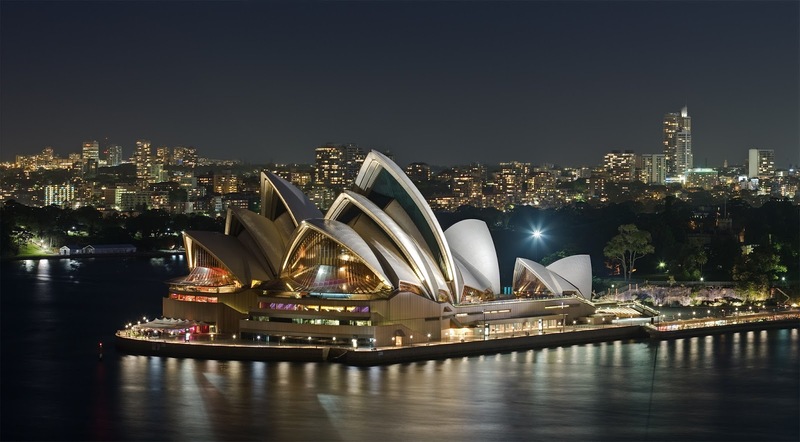 The design of the Sydney Opera House was inspired by nature, its forms, functions and colours. Utzon was influenced in his designs by bird wings, the shape and form of clouds, shells, walnuts and palm trees. He looked upon nature for guidance when designing, as nature over time combined both efficiency and beauty, hand in hand. The roof structures of the Opera House are called ‘shells’. The design of the ‘shells’ was one of the most difficult aspects of the building’s design. Jorn Utzon claimed that the final design of the shells, was inspired by peeling an orange. It is said that the shells of the 14 separate roofs, form a sphere if combined. The architectural style is Expressionist Modernism – which involves innovative form and use of novel materials. The Sydney Opera House began being constructed in 1959, and it was officially opened in 1973. While the original cost of the Sydney Opera House was estimated to be $7 million AUD, it ended up costing $102 million AUD – more than 14 times the initial estimate. The building of the house measures 187 meters (613 feet) long and 115 meters (377 feet) wide.It sits on 5.798 hectares of land and 8 boeing 747 can park inside the facility wing to wing. The Opera House’s sails were built using cranes made specifically for the job in France, each costing $100,000 AUD. There are approximately 1 million roof tiles covering an area of approximately 1.62 hectares that sit over the structure. They were made by a Swedish tile company, Höganas. The Grand Organ in the Opera house was built for a period of 10 years. It is the largest mechanical music instrument in the world with 10,154 pipes. Within the facility are 7 performance venues that include; the Concert Hall, the Opera Theatre, Playhouse, Drama Theatre, The Studio, the Forecourt and the Utzon Room. The Concert Hall as the largest seating venue a maximum of 2,679 guests and the Utzon room as smallest venue only having capacity for 210. The Sydney Opera House was constructed by about 10,000 workers and was opened by Queen Elizabeth II on 20th October, 1973. The Sydney Opera House is Australia’s most recognisable building and is an icon of Australia’s creative and technical achievement. The Sydney Opera House hosts 3,000 events every year. Its performances have an annual audience of two million. 200,000 people per year take a guided tour of the building. Sydney Opera House is open to the public 363 days a year – closed on Christmas Day and Good Friday. Staff work every day of the year, 24/7. Sydney Opera House was added to UNESCO's World Heritage List in 2007.